Praise Intel for its CPUs all you want, but for my money the coolest thing Intel is doing right now is in the storage space. I know. What a yawn, storage. But upgrading your storage is one of the absolutely best ways to improve the performance of your computer, and Intel providing support for its super cool storage tech in laptops is a big and exciting deal. The storage in question is Intel Optane, and we’ve written about it at length before. It’s based on an entirely new storage medium known as 3D Xpoint that can theoretically be nearly as fast as something like RAM—which forgets everything it reads and writes as soon as the computer powers off—but persistent like NVRAM—the stuff in your SSDs currently. 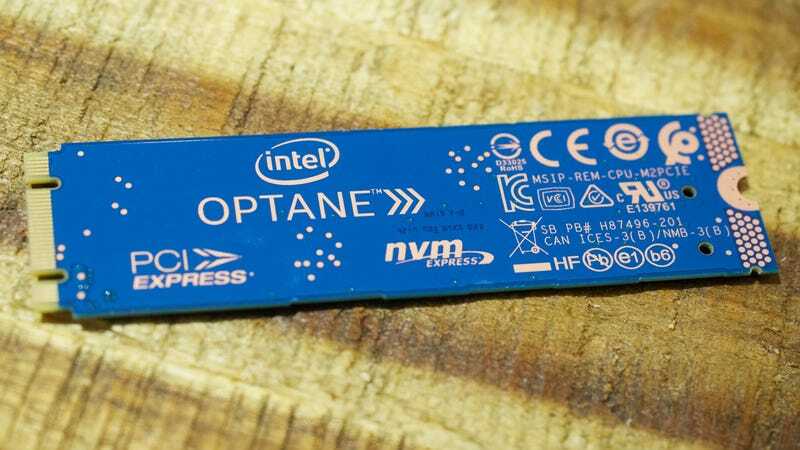 Optane is currently availabe in two forms, Optane SSDs and Optane Memory. The former is an SSD, just based on Optane tech, and when we reviewed one back in early March, we were suitably impressed by its speed—even if it’s high price of $130 for just 113GB of storage was too much to bear. The latter is maybe a little more exciting: Optane Memory (we reviewed it last year). This stuff is much cheaper—think $30 for a stick, and works in tandem with your storage drive, remembering commonly loaded files, like game textures or software libraries, and loading them faster than your storage drive alone ever could. In our tests the Optane memory paired with a traditional HDD, was two to three times faster than without the memory. SSDs saw a smaller improvement, but in some cases was still twice as fast. Intel’s 8th-gen CPUs now have support for both kinds of Optane across the board. Previously it was limited to desktops, but now it can be used in laptops as well. Intel also says support is coming to use Optane memory with secondary storage drives. So you can put the fastest SSD you can afford into you desktop and run the system on it and then have a big cheap hard drive disk full of games supercharged by the Optane memory. While no laptop makers have announced support yet expect to find this in gaming laptops and workstations first before trickling down in more mainstream devices—likely as a mix of either an add-on you select or included automatically with purchase. Price should theoretically be a little more than the current cost for an SSD plus Optane memory solution for desktops, while laptops using Optane SSDs will cost more due to the high price of the storage itself.